This year the Goldsmiths Guild of Copenhagen celebrates its 585 years anniversary and what would be more appropriate than to honor great craftsmanship with a little competition. The winner of the competition will be announced tomorrow at 16.00 so please cross your fingers for me as I’m up against very talented and skilled goldsmiths and designers. 585 is the hallmark for 14 karat gold, a gold alloy that holds 58,5% gold, and the brief for the competition was to create a 14 karat gold ring, no heavier than 5 grams, with a 0.05ct diamond set in it. The ring could then be backed up by a series of rings with a more artistic feel. So the silversmith (me) started working; and from this sprung a series of rings in gold and silver sprinkled with a bit of diamonds, sapphires and pearls with a soft and organic feel. The collection takes it starting point in the structures of traditional diamond jewellery which is often a bit too rigorous and edgy for my taste. My solitaire ring is straightforward; the setting for the stone is organic and rounded and the ring shank has been given extra weight at the bottom, so it sits light and elegant on the finger, but does not seem stingy. The next rings (unfortunately not photographed yet) copies the structures of classical 5- and 7-setting rings, but an asymmetrical and random placing of the settings gives the rings a lively and organic expression. And then in the next generation of the rings the settings has had their own life and grown wild, just as some lush undersea vegetation. After handing in my work for the competition in February I have continued working with the little organic settings with or without stones and have had a great response to the pieces. They can be seen and tried on in the shop over the next months. A few years ago i made this little silver box for an exhibition on Bornholm (one of my favorite places in the world). The title of the exhibition was ‘Lækkerier’ (‘Sweeties’) and I found it intriguing to work with the delicious shape of a meringue; making a box that would protect your meringue, should you bring it with you in your pack lunch. ¨The shape is a complex juxtaposition of curves that comes naturally when extruding the egg/sugar-fluff with a piping bag. Unfortunately I wasn’t able to use that technique when baking a fine silver meringue; but, with the help of a press tool I made up for the purpose and a lot of hammering and fitting, I succeeded. The result being a very beautyfull yet rather expensive piece of silver, as it took quite some time to make. Back to the Kiss; in Danish we call this meringue a ‘kiss-cake’. I was overwhelmed with the attention this little piece of silver got and it spurred me on to work on a less expensive version, that would make it possible for more people to bring their meringue unharmed to work every day, or simply add some more beauty to our world. I always dreamed of being a glassblower. Glass is magic, it has vibrant colors, transparency, is worked when it is glowing hot and it is a relatively cheap material; everything that gold and silver isn’t. I never had the chance to learn glassblowing and now I’m quite content to work in metal. However I feel very happy to have taken the time to experiment with some lampwork and have practiced blowing tiny bubbles of colorful glass in my workshop. 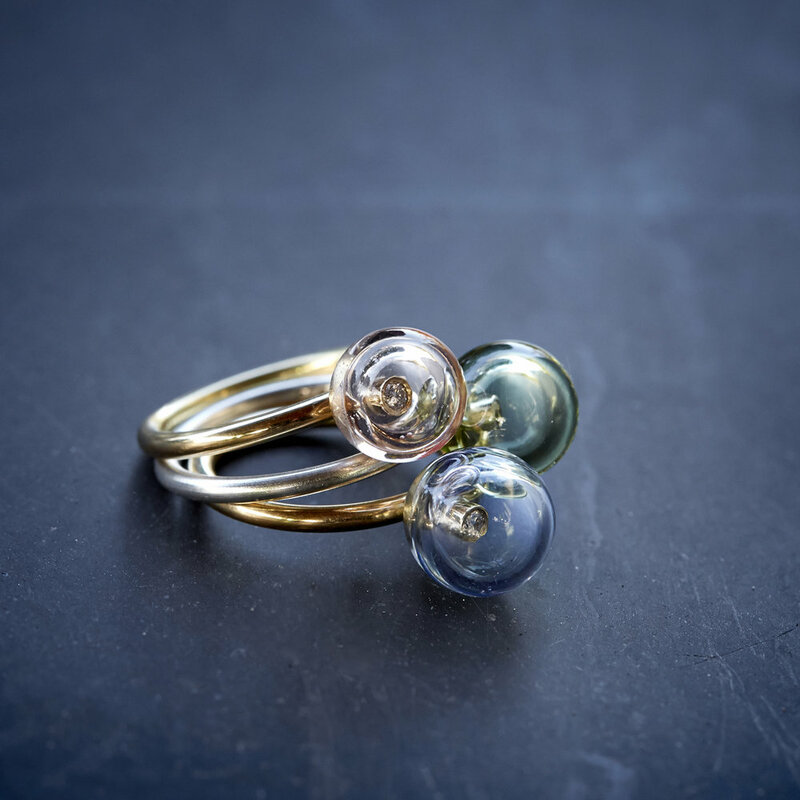 The result being ‘In case of emergency – break glass’;the name of the ring where an airy glass bubble embraces the setting of a sparkling diamond in a silver or gold ring. A poetic and humorous take on the classic solitaire ring. Beauty, simplicity and the flora of the Nordic countries is the starting point of my new series of jewelry. Little elegant buds in polished or oxidized silver to remind us that even though the winter is long, cold and dark, it is filled with bright moments and spring WILL return once again. All pieces are produced by hand at the workshop in Copenhagen; some in series and some in one-offs. Stop by the shop to see some more models. The spoon is just a simple tool that does not make much fuss, but spoons have a very special place in my heart and with this exhibition I will try to share that passion with you. The spoon is lovable because of its friendly and feminine nature, with its round leaf as a head and its long shank as a body it resembles a small person. The spoon represents, for example, the regular everyday life and have always done it, it is an object we all handle on a daily basis and even put in our mouths. The spoon is the first tool we learn to handle and thus it is the spoon that separates humans from animals, as we have learned the good manners so we can consume our food in a civilized manner. To elevate the spoon to be a symbol of the culture we have created is perhaps going a little too far, but through my work I want to put more focus on this little creature being placed above the plate and signals that there will be something sweet after the main course. As an opposition to the use-and throw-away culture, I want to create unique objects that speak to the senses and generates joy through daily use. 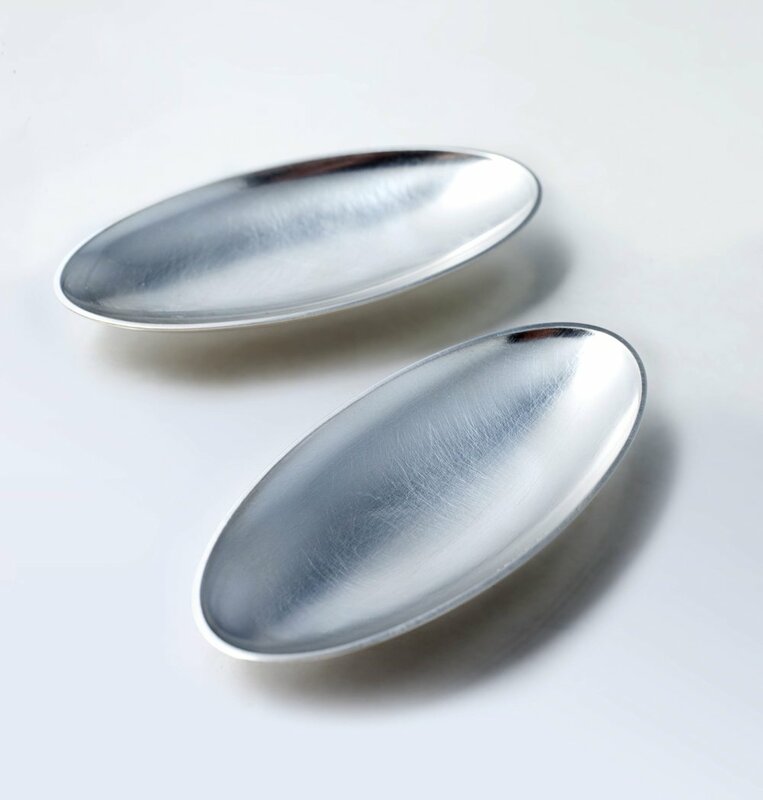 My spoons are made by hand and must be experienced by hands: therefore I have called the show ‘Spån’. Spån is Danish for chip and refers of course to the manufacturing process and in addition, the English word ‘Spoon’ is a derivation of the word ’spån’. The exhibition is a part of the Sct. Loye event arranged by the Guild of Jewellers in Copenhagen. A list of the other exhibitions can be seen here. In connection with Queen Elizabeth’s diamond jubilee, I was trusted to make a brooch which was given to her when she, on her trip around the country, visited the town of Exeter. The brooch was designed by the Danish couple behind Studio RoSo whom I met during my studies at The Royal College of Art. The two designers has just designed a very beautiful piece of art to be installed in the town of Exeter, and the brooch was a miniature part of this sculptural representation of a tree. The many polished facets was a great challenge to my craftsmanship, but with a good deal of patience and technical skills the brooch was successfully completed and the queen was indeed happy when she received it at May 2nd in Exeter. In the middle of a worldwide economic crisis some might say that it is absolutely not the right time to open a new shop presenting luxury goods. Oh well, I’ll be happily naive and go ahead anyway, because I actually believe it is a perfect time. A wise colleague of mine often say that ‘There is always a need for skilled people’. I keep playing that mantra on my internal player while I keep calm and believe that it’s the right thing to do. I am a craftsman and designer and therefore I can create objects with my hands and I posses the skills of innovation and creativity much valued for the future of f.ex. the Danish production industry. I can take a piece of material, use my hammer on it and create some value or I can draw a design on my computer, 3d print it, make it a prototype and thereby take the first step towards a larger production. I know that it’s a drop in the ocean and that I sound a bit like some famous egg-selling lady, but I just love that my metier is so simple that I, by combining new technologies with traditional manufacturing techniques, creativity and good old craftsmanship, can create something valuable out of a piece of raw material. I was invited to make a choker for a jewelry exhibition. A choker is a necklace that is very tight around the neck and often very nasty to wear. It comes into fashion every now and then but never seem to hang around for long. Possibly because it isn’t as nice to wear as the very popular sautoir. I’m pleased with the result that can be seen next weekend with lots of other chokers, at the yearly get-togeather of trades people within the gold and silver industry in Denmark, in Bellacenter. After that It’ll be on display at the SAS-hotel at Vesterport. No no no, not yet!!!! It’s only the beginning of August and we’ve just survived a very rainy July. I’ve made this ice cream spoon for carrying in your pocket so you don’t have to use the colourfull plastic ones you get at ice cream bars. They are simply too small and too plasticky! Ever since I was a child, I’ve spend my summer holidays in the beautiful island of Bornholm; a magical place where the sea is very blue, the smoke houses can make silver into gold and the churches are round. I never really noticed the details of the round church of Østerlars as it has just become an iconic image of tourism in Bornholm. But after digging into it and working with the model here, I’ve been intrigued by the interaction between the strict geometrical shapes and the randomness of the supporting pillars. When the pendant is worn, it looks more like a rocket than a round church, but who knows, maybe rockets will be the next icon for Bornholm. The world of the new millennium is on ‘fast forward’. The multi media culture offers a huge number of entertainment possibilities, an extreme amount of visual influence and a six-lane information highway and owing to a highly developed mobile technology and fast Internet access, everybody is ‘online’ and ‘in touch’ wherever they go. As an intelligible reaction towards this bombardment of information and the increasing demand of personal availability, people tend to turn their homes into safe shelters; a tendency recognised as ‘cocooning’. Time to oneself has become a luxury, and soft values such as intimacy, veracity and authenticity is highly esteemed within the domestic space. In the field of foods and drinks, I find that cocooning is recognised in the increasing interest in comfort foods and drinks. One of the most well known is the hot drink ‘Café Latte’, a milk based coffee drink, but also ‘chai latte’, ‘frappuchino’ and various fruit smoothies are popular comfort drinks. Common to these drinks is that they, due to their size, often are served in tall glasses where the long spoon comes in handy. The spoon is mainly used for stirring, but also for enjoying the milk froth or even just as a decorative accessory. This tendency of enjoying comfort drinks within the domestic environment, alone or most likely with a partner or close friend, was the rationale for designing a long silver spoon. Skeen er et af de ældste redskaber vi kender og det er derfor interessant at udforske dens funktionalitet. Hvornår er den en ske og hvornår bliver den et ikke-funktionelt objekt? Med udgangspunkt i skeens simpleste form har jeg designet de seks skeer, alle med samme blad, men med skafter der er bøjet i seks forskellige grader. Tanken var således at jo krummere skaftet blev, jo sværere blev skeen at bruge. Efterfølgende har mange dog udtrykt ønske om at prøve at spise med den mest krumme ske og flere har foreslået alternative funktioner til den. Dette ser jeg i høj grad som et bevis på menneskelig nysgerrighed og en lyst til at lege med de objekter der omgiver os i vores hverdag og endnu et spørgsmål melder sig; Er funktionalitet kun et spørgsmål om attitude og velvilje? 2-dimensionelt design var særdeles udfordrende og brugen af farver tilførte arbejdet et, for mig, hidtil ukendt element. Inspireret af den britiske tradition for mønstre og ornamenter, og med afsæt i et stærkt grafisk udtryk og rolige, men stærke farver, designede jeg flere forskellige bud på moderne skandinaviske mønstre. The spoon is one of the first tools we know of and it is therefore interesting to explore its functionality and the preconceptions of the iconic spoon.